In a large saucepan, cook the bacon over moderate heat until crisp. Remove the bacon with a slotted spoon and drain on paper towels. Pour off all but 1 tablespoon of the fat. Reduce the heat to moderately low. Add the onion, carrots, celery, and turnip and cook, stirring occasionally, until the vegetables start to soften, about 5 minutes. Stir in the caraway seeds, cabbage, and chicken broth and bring to a simmer. 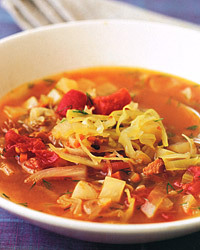 Reduce the heat and simmer, covered, until the cabbage wilts, about 5 minutes. Stir in the tomatoes, brown sugar, salt, pepper, vinegar, and raisins. Cover and simmer for 30 minutes. Stir the bacon and the dill, if using, into the soup. Serve the soup topped with a dollop of sour cream, if using. When it comes to wine, no one does sweet-and-sour like the Germans. It's that dynamic balance between sugar and fruity acidity that makes their wines not only delicious, but a perfect match for this soup. A Pfalz Riesling Spätlese will have just the right weight and richness. Review Body: Made it at work this morning in my crock pot. Its almost lunchtime and it smells delicious. Cooked it on high to make it fit our time schedule but it is working out beautifully.